Once the prized riding toy of children of decades past, antique toy pedal cars are popular among toy collectors, classic car owners and just about anyone with a love of nostalgic toys. In the late 1890s and early 1900s as automobiles became more popular, toy manufacturers soon realized that smaller versions for children would make great riding toys. Powered by leg power, the first pedal cars, modeled after the cars of the day, soon became the toys of the children of the wealthy upper class. The miniature models of full size gas powered cars reached the first peak of their popularity in the late 1920s and early 1930s. 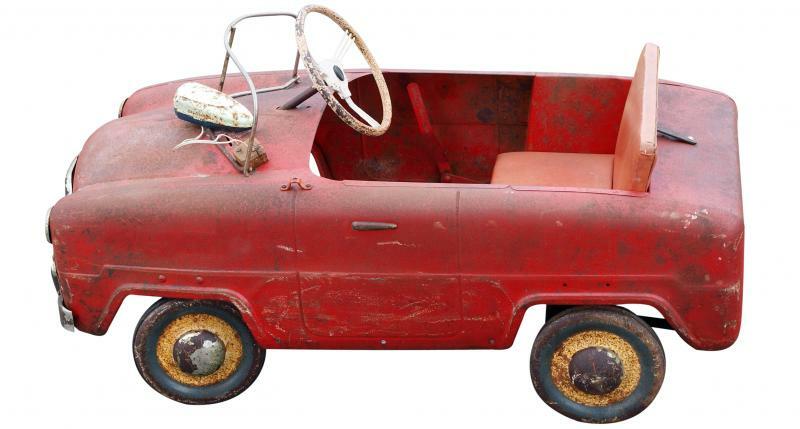 After World War II, pedal cars were more in demand than ever before. With the economic prosperity that followed the war, combined with the lower prices of these ride on toys, more families could afford pedal cars for their children. In the later part of the 1970s, the rugged steel bodied pedal cars gave way to the modern plastic versions of pedal powered vehicles. For many pedal car owners, part of the enjoyment of having a car is in the restoration of the vehicle. Just like full sized cars, owners buy restoration parts and bring back these toys of yesteryear to their original condition. For collectors that are not mechanically inclined, there are companies that specialize in restoring pedal cars. Many companies provide both of these services and may also offer fully restored cars for sale. Pedal Car.com will restore your pedal car or supply you with the pedal car parts for you to do the restoration. They also will help with the identification of a pedal vehicle. In addition, the company offers a large selection of reproduction pedal cars and planes. Portell Restorations Last Chance Garage offers a wide assortment of pedal car parts and books. Dan and Linda Portell also offer several beautiful fully restored pedal cars for sale. Cowboys and Kidillacs offers a fifty page catalog of their restoration parts. D & S Pedal Car Restorations does not sell parts. They offer restoration, identification and appraisals services. Naturally, everyone has their own personal favorite model pedal car. Perhaps it is one that is a replica of your very first car or a car you always wished you had owned. Maybe it is one that brings back fond memories of a grandparent or a first love. The following links are to some of these fabulous riding toys from the past. Pedals and Pumps provides great pictures of the restored pedal cars in his collection There is also a link to a fantastic slideshow of original old photographs of children playing with their pedal cars. Pedal Cars Galore offers a wide assortment of reproduction pedal cars, planes and trains. Their riding toys are made in made in Korea or China. Although reproductions resemble the original pedal cars, there are often variations necessary to meet the current safety standards. For many people antique toy pedal cars bring back memories of their childhood.